An update to yet another successful card solitaire game is released. One week ago, Most Popular Solitaire 2.00 was published by Goodsol Development. This is a major upgrade to a product first released (for Windows) in 2003. Most Popular Solitaire is a collection of 30 of the most popular (surprise!) card solitaire games, including all of the favorites: Klondike (often known as simply Solitaire), FreeCell, Spider, and a number of (well, 27, obviously) others. 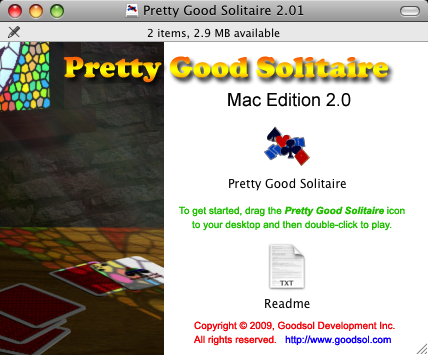 In terms of technology, this release used the same revisions of our Goodsol Solitaire Engine that were used for Goodsol Solitaire 101 version 1.01 (on Windows) and Pretty Good Solitaire Mac Edition 2.01 (on Mac OS X). These are the last planned updates before the next GSE upgrade, which will add a few additional features and make some internal changes to reduce the source code differences between platforms. The marketing challenge for this product is handling both the Windows and Mac OS X versions simultaneously. Having the same price (and registration codes) for both makes it easier, and also allows customers to switch to Mac (you know, or the other way) without having to repurchase. The biggest issue is the different approach to trial versions: whereas the Windows version can be converted into the full version by entry of the registration code, the Mac OS X version has a separate full version download. In the three weeks since the latest Pretty Good Solitaire Mac Edition update, that product has risen (back) into the top 5 on Most Popular in the Cards & Puzzles category for Apple Downloads, but Most Popular Solitaire (Mac Edition) is now in the top 20 (and climbing) in only a week. Downloads of both products (trial versions) are increasing, but we will have to see how that translates into sales. In any event, somebody is enjoying our games, and I dig that.